Reading and share top 239 famous quotes and sayings about Shelves by famous authors and people. Browse top 239 famous quotes and sayings about Shelves by most favorite authors. 1. "Shelves filled with jars of items meant for spells and ridiculous concoctions meant to heal bodies, inflict sickness, remove memories and countless other purposes covered most of the walls. The people brave enough to venture out into this part of the swamp and walk through this door were the ones most desperate for an answer. Most people who knew of the true power of voodoo stayed away. It wasn't an evil humans needed to dabble in. It could possess you, steal your soul if you allowed it." 2. "The ceremony was fast so we wouldn't be caught. When it was over, the men all whispered 'Mazel tov' and climbed back onto their shelves. I went up to the boy and pressed the wooden horse into his hands, the only present I could give him. The boy looked at me with big, round eyes. Had I ever been so young? 'We are alive,' I told him. 'We are alive, and that is all that matters. We cannot let them tear us from the pages of the world. 'I said it as much for me as for him. I said it in memory of Uncle Moshe, and my mother and father, and my aunts and other uncles and cousins. The Nazis had put me in a gas chamber. I had thought I was dead, but I was alive. I was a new man that day, just like the bar mitzvah boy. I was a new man, and I was going to survive." 3. "God in the safe and Ford on the shelves." 4. "My daughter is seven, and some of the other second-grade parents complain that their children don't read for pleasure. When I visit their homes, the children's rooms are crammed with expensive books, but the parent's rooms are empty. Those children do not see their parents reading, as I did every day of my childhood. 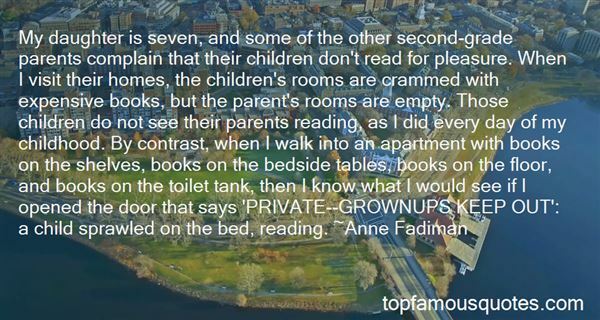 By contrast, when I walk into an apartment with books on the shelves, books on the bedside tables, books on the floor, and books on the toilet tank, then I know what I would see if I opened the door that says 'PRIVATE--GROWNUPS KEEP OUT': a child sprawled on the bed, reading." 5. "And cruelly, surely, I said to her, "Did you love this child?" I will never forget her face then, the violence in her, the absolute hatred. "Yes." She reached for the locket even as I clutched it. It was guilt that was consuming her, not love. It was guilt -that shop of dolls Claudia had described to me, shelves and shelves of the effigy of that dead child. But guilt that absolutely understood the finality of death. There was something as hard in her as the evil in myself, something as powerful. She touched my waistcoat and opened her fingers there, pressing them against my chest. And I was on my knees, drawing closer to her, her hair brushing my face." 6. "Still, there are many things we can toss at them that don't require magic at all. Acid. Hot oil. Bookshelves." 7. "He passed his hands over some of the fine embossed bindings as he thought, I am a book also, words and thoughts and stories held together by flesh. We open and close ourselves to the world. We are read by others or put away by them. We wait to be seen, sitting quietly on shelves for someone to bother having a look inside us. " 8. "They only asked for punishments that fitted their crimes. Not ones that came like cupboards with built-in bedrooms. Not ones you spent your whole life in, wandering through its maze of shelves." 9. "...She's not buying [the lie], but there's nothing else on the shelves." 10. 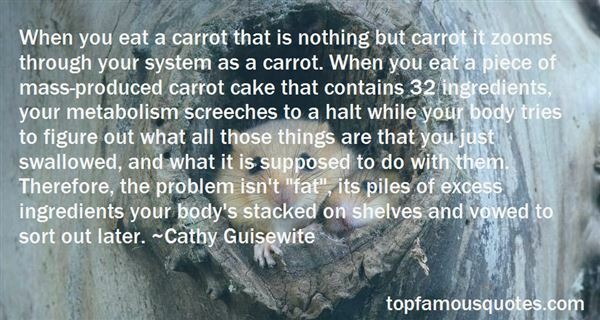 "When you eat a carrot that is nothing but carrot it zooms through your system as a carrot. When you eat a piece of mass-produced carrot cake that contains 32 ingredients, your metabolism screeches to a halt while your body tries to figure out what all those things are that you just swallowed, and what it is supposed to do with them. Therefore, the problem isn't "fat", its piles of excess ingredients your body's stacked on shelves and vowed to sort out later." 11. "He went through rooms he named as he discovered them, and which he hardly had time to appreciate before he'd flung open a door at the far end and plunged through. . . . and in the Library of All the Same Book he actually stopped to examine a few of the volumes, all titled Various, that lined the shelves." 12. "The old man was peering intently at the shelves. 'I'll have to admit that he's a very competent scholar. 'Isn't he just a librarian?' Garion asked, 'somebody who looks after books? 'That's where all the rest of scholarship starts, Garion. All the books in the world won't help you if they're just piled up in a heap." 13. "Well," her mother said, looking at the engine, "at least that's still there. ""Do you know anything about engines?" Stephanie asked. "That's why I have a husband, so I don't have to. Engines and shelves, that's why men were invented. "Stephanie made a mental note to learn about engines before she turned eighteen. She wasn't too fussed about the shelves." 14. "One, I have a wonderful publisher, Black Sparrow Press; as long as they exist, they will keep me in print. And they claim they sell very respectable numbers of my books, so I guess, and it's true, every place I go, my books are in libraries and on bookshelves." 15. "The mother was holding a baby, had a stroller with what looked like twin girls around three, and had a five-year-old boy who was running around the shelves with a finger shoved up his nose. I considered warning him that if he fell, he would poke his brain out, but it struck me that losing intelligence was not something he was worried about." 16. "If people wrote their reviews on paper and put them into a real, physical library, I am sure that the Goodreads administrators would be very reluctant to pull them down from shelves and burn them. When you can get rid of a piece of writing just by clicking on a few links, there's a temptation to believe that it's less serious. But it isn't. It's just less clear what you've done." 17. "In winter darkness, the Baghdad Arabian keen blue deepness of the piercing lovely January winter's dusk--it used to tear my heart out, one stabbing soft star was in the middle of the magicalest blue, throbbing like love--I saw Maggie's black hair in this night-- In the shelves of Orion her eye shades, borrowed, gleamed a dark and proud vellum somber power brooding rich bracelets of the moon rose from our snow, and surrounded the mystery." 18. "In a sense, we can tell a lot about anyone by looking at what books, if any, he reads, at what books are on his shelves. . . . I have always found books to be helpful, yet they must be good books." 19. "He eyed in the far corner of the room the carton of books they'd schlepped across the pond(ocean) They were both fearful of being stuck without a decent book, and who knew they would find everything from Virgil to Synge on the shelves of a fishing lodge?" 20. "You go into the office and take a book or two from the shelves. You read a few lines, like your life depended on reading 'em right. But you know your life doesn't depend on anything that makes sense, and you wonder where in the hell you got the idea it did; and you begin to get sore." 21. "Every room I've lived in since I was given my own room at eleven was lined with, and usually overfull of, books. My employment in bookstores was always continuous with my private hours: shelving and alphabetizing, building shelves, and browsing-- in my collection and others-- in order to understand a small amount about the widest possible number of books. Such numbers of books are constantly acquired that constant culling is necessary; if I slouch in this discipline, the books erupt. I've also bricked myself in with music--vinyl records, then compact discs. My homes have been improbably information-dense, like capsules for survival of a nuclear war, or models of the interior of my own skull. That comparison--room as brain-- is one I've often reached for in describing the rooms of others, but it began with the suspicion that I'd externalized my own brain, for anyone who cared to look." 22. "I lived in the royal library, among all the books. ""You resided in a... library? ""There were suites inside and great balconies that overlooked the city, but yes. I was most content among those shelves, so one night, I simply never left." 23. "About eighty percent of the food on shelves of supermarkets today didn't exist 100 years ago." 24. "Listen, I'm bossy. I can't help it. It's who I am and what I do. I'm pushy and I like to take over. But I'm going to work really hard not to do so much and your going to try and accept me the way I am. Flaws and all. Because I'm good in bed and I can carry heavy things and reach all the high shelves." 25. "I felt instantly at home, and wanted only to dismiss Alistair, along with the rest of Justice Hall, that I might have a closer look at the shelves.I had to content myself instead with a strolling perusal, my hands locked behind my back to keep them from reaching out for Le Morte D'Arthur, Caxton 1485 or the delicious little red-and-gilt Bestiary, MS Circa 1250 or.... If I took one down, I should be lost. So I looked, like a hungry child in a sweet shop, and trailed out on my guide's heels with one longing backward glance." 26. "Stretched out in front of me was my time as an adult, and then a skeleton, and then nothing except perhaps a few books on a few shelves." 27. "We have a lot of books in our house. They are our primary decorative motif-books in piles and on the coffee table, framed book covers, books sorted into stacks on every available surface, and of course books on shelves along most walls. Besides the visible books, there are books waiting in the wings, the basement books, the garage books, the storage locker books...They function as furniture, they prop up sagging fixtures and disguised by quilts function as tables...I can't imagine a home without an overflow of books. The point of books is to have way too many but to always feel you never have enough, or the right one at the right moment, but then sometimes to find you'd longed to fall asleep reading the Aspern Papers, and there it is." 28. "But some of the greatest achievements in philosophy could only be compared with taking up some books which seemed to belong together, and putting them on different shelves; nothing more being final about their positions than that they no longer lie side by side. The onlooker who doesn't know the difficulty of the task might well think in such a case that nothing at all had been achieved." 29. "Besides, Fi was convinced that instinct could determine a body's literary needs, just as physical cravings pointed to dietary shortfalls. She'd experienced it herself more than once among the library's dense shelves; not knowing what she should read next, she'd wandered, sniffing slightly, palms open. When intuition hit, she felt a sensation she couldn't describe exactly: her hands seemed to know where to go. And when she reached, invariably she found exactly the book she needed at that moment - sometimes fiction, sometimes biography, sometimes a slim volume of obscure poetry"
30. "Outside the house is a world where the shelves are stocked, where radio waves are full of music, where young men walk the streets again, men who have deprievation and a fear worse than death, who have willingly given up their early twenties and now, thinking of thirty and beyond, haven't any time to spare." 31. "At the gun shop, AK-47s were stacked six high on the shelves … The day after the West invaded Afghanistan, a ‘piety discount' was introduced for those who wished to buy the weapon to go the jihad." 32. "Fiction does something unique in that it takes us out of our heads and puts us into other people's heads. 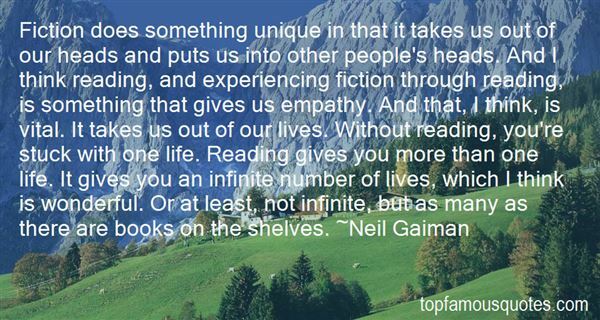 And I think reading, and experiencing fiction through reading, is something that gives us empathy. And that, I think, is vital. It takes us out of our lives. Without reading, you're stuck with one life. Reading gives you more than one life. It gives you an infinite number of lives, which I think is wonderful. Or at least, not infinite, but as many as there are books on the shelves." 33. "Effectively we become the DVD of Elf that you ignore at nine o'clock on a Friday night, on the presumption there will be something better (at least, something more fulfilling, more complex, and that you haven't seen twice before) on the shelves somewhere. And guess what you end up going home with? Well, that's what we are to these beautiful, fantastic women: Elves." 34. "He's spilled the beans. He's poured out His intentions, allowing us full access. The humans put the Forbidden Book on display tables and shelves. But we actually read it; indeed we must no matter how loathsome." 35. "I use a library the same way I've been describing the creative process as a writer — I don't go in with lists of things to read, I go in blindly and reach up on shelves and take down books and open them and fall in love immediately. And if I don't fall in love that quickly, shut the book, back on the shelf, find another book, and fall in love with it. You can only go with loves in this life." 36. "Having come to the conclusion that there was so much to do that she didn't know where to start, Mrs Fowler decided not to start at all. She went to the library, took Diary of a Nobody from the shelves and, returning to her wicker chair under the lime tree, settled down to waste what precious hours still remained of the day." 37. "Here is my room, in the yellow lamplight and the space heater rumbling: Indian rug red as Cochise's blood, a desk with seven mystic drawers, a chair covered in material as velvety blue-black as Batman's cape, an aquarium holding tiny fish so pale you could see their hearts beat, the aforementioned dresser covered with decals from Revell model airplane kits, a bed with a quilt sewn by a relative of Jefferson Davis's, a closet, and the shelves, oh, yes, the shelves. The troves of treasure. On those shelves are stacks of me: hundreds of comic books- Justice League, Flash, Green Lantern, Batman, the Spirit, Blackhawk, Sgt. Rock and Easy Company, Aquaman, and the Fantastic Four... The shelves go on for miles and miles. My collection of marbles gleams in a mason jar. My dried cicada waits to sing again in the summer. My Duncan yo-yo that whistles except the string is broken and Dad's got to fix it." 38. "She herself was a victim of that lust for books which rages in the breast like a demon, and which cannot be stilled save by the frequent and plentiful acquisition of books. This passion is more common, and more powerful, than most people suppose. Book lovers are thought by unbookish people to be gentle and unworldly, and perhaps a few of them are so. But there are others who will lie and scheme and steal to get books as wildly and unconscionably as the dope-taker in pursuit of his drug. They may not want the books to read immediately, or at all; they want them to possess, to range on their shelves, to have at command." 39. "There will be birthdays in the next twelve months; books keep well; they're easy to wrap: buy those books now. Buy replacements for any books looking raggedy on your shelves." 40. "Robert Hughes, Time magazines's art critic, told him on the phone that after he saw the planes flying over SoHo he had walked around in shock. On his way home he had stopped by a bakery and found the shelves cleaned out. Not a loaf remained, not a bagel, and the old baker standing amid the emptiness spread his arms and said, 'Should happen every day." 41. "This new understanding of processes on Europa would not have been possible without the foundation of the last 20 years of observations over Earth's ice sheets and floating ice shelves." 42. "I've taken over the guest room wardrobe too- plus, I've arranged all my shoes on the bookshelves on the landing. (I put the books in boxes. No one ever read them. anyway.)" 43. "Furnishing was not a priority in the Citadel. Shelves, stools, tables... There was a rumor among the novices that priests towards the top of the hierarchy had golden furniture, but there was no sign of it here. The room was as severe as anything in the novices' quarters although it had, perhaps, a more opulent severity; it wasn't the forced bareness of poverty, but the starkness of intent." 44. "I quickly, swiftly, reach in, pluck out, and peer into the mirror. 'I am still here.' I am in the glass, in this moment. After this moment, I may not be here; I may be a person who does not know where she is, or why. I leave the kitchen table to bathe, and to dress for church. If only my closet held on its shelves an array of faces I could wear rather than dresses, I would know which face to put on today. As for the dresses, I haven't a clue." 45. "It's a piece of cake, being a lawyer or a doctor or a computer systems analyst or an accountant. Libraries are full of books telling you how to do it. The only textbooks for private eyes are on fiction shelves, and I don't remember ever reading one that told me how to interrogate an eight-year old without feeling like I was auditioning for the Gestapo." 46. "Come indoors then, and open the books on your library shelves. For you have a library and a good one. A working library, a living library; a library where nothing is chained down and nothing is locked up; a library where the songs of the singers rise naturally from the lives of the livers." 47. "In the wide pile, by others heeded not,Hers was one sacred solitary spot,Whose gloomy aisles and bending shelves containFor moral hunger food, and cures for moral pain." 48. "The book was thick and red. It was almost thicker than it was wide, a thickness that somehow enhanced its bookishness. It was - to me aged 12 - quite clearly more of a book than most, if not all, of the paperbacks untidily stacked on the shelves of my father's study." 49. "Something among dusty shelves of ordered certitudes long divorced from reality, desiccating peacefully, as if a breath of that air which sees injustice done"
50. "Books lined the shelves of bookstores like kids standing in a row to play baseball or soccer, and mine was the gangly, unathletic kid that no one wanted on their team." With fame, you can't trust everybody. You can't depend on them being there for you as a person. They will only be there because of what you've got you as a person. They will only be there because of what you've got and what you can bring to their life. It's not a relationship-it's a leech."